Last Update: 2018-09-08 - Major Update: Added support multiple exclude file filter masks to the same include filter mask. 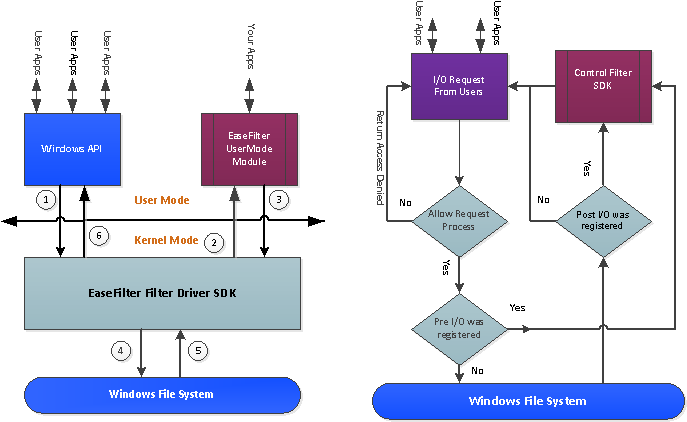 File system monitor filter can monitor the file system activities on the fly. With file system monitor filter you can monitor the file activities on file system level, capture file open/create/replace, read/write, query/set file attribute/size/time security information, rename/delete, directory browsing and file close request. You can develop the software for . You can develop the software for continuous data protection (CDP), auditing, access log, journaling.